Thanks to the family of Frances Hugle for the following information. Frances Hugle was born Frances Betty Sarnat 13 August, 1927 in New York to Nathan and Lilyan (Steinfeld) Sarnatzky, both immigrants. 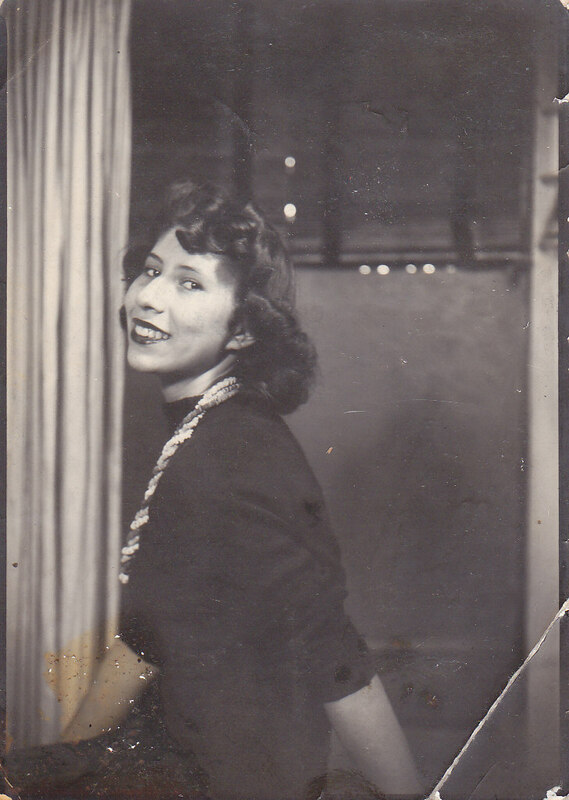 She lived in Chicago until starting her first business with her husband, William Bell Hugle, in 1948. 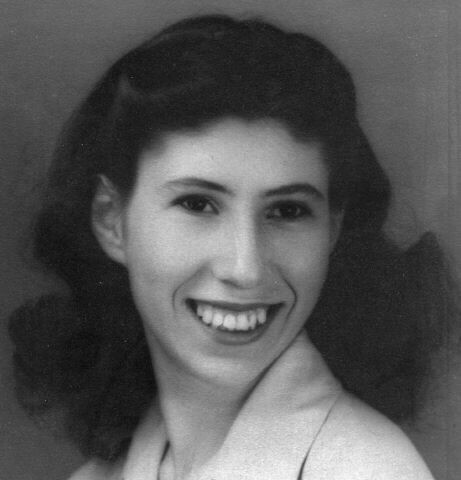 Fran attended Hyde Park High School (where she and Bill met), being the first girl to win the Wilson Jr. College Math Tournament at age 16 in 1944. She graduated that year and entered the University of Chicago, where she earned her Ph. B. in two years. She then entered the UC Medical School but left medical school in 1947. In 1948, they founded their first company together, Hyco-Ames, and the couple set it up at her parents’ apartment. Hyco-Ames focused on developing gem-quality star sapphires and rubies. Though Hyco-Ames never produced the gems (they were focused on securing funding and developing the equipment they needed), Fran designed and built a completely automatic Verneuil furnace, six cubic feet large, that could reach the necessary temperature of 3600 degrees. Later in 1948, they secured financial support from New York attorney John G. Broady and Hyco-Ames became Stuart Laboratories. The company first operated out of Broady’s high-rise office building in lower Manhattan but later moved to North Bergen, New Jersey into a proper factory space. During the early years, Fran continued to design and build the crystallography equipment she needed but did not pursue patents on any of it. She was 21 years old and apparently still rather naive about such things. The company did succeed in creating the first gem-quality (translucent) star sapphires/rubies in November of 1949 and began selling the stones. However, in March of 1950, Linde (Union Carbide) filed a patent infringement suit against Stuart Laboratories and Bill Hugle and succeeded in shutting down production. The company folded in 1951 after the courts ruled for Linde. Linde went into production of its own star sapphires and rubies shortly thereafter, but all of their stones were opaque, having never achieved the translucence of Fran’s stones. From 1951 until 1953, the Hugles founded additional companies with contracts to grow crystals for the nascent electronics industry. Then in 1953, they were both hired by Baldwin Piano Company of Cincinnati. Baldwin at that time was expanding into the electronics business, initially to develop an electronic musical instrument, but later for broader purposes. Fran was Advanced Research Engineer at Baldwin and Bill her supervisor. While at Baldwin, she wanted to learn the business thoroughly and insisted upon building a piano herself from the bottom up. That piano was in our home and all four of her children learned to play on it. At Baldwin, Fran and Bill became prolific inventors, filing numerous patent applications, some of which Baldwin formally filed and others that languished in Baldwin’s engineering division. Among those were patents filed in 1956 and 1957 for methods of producing semi-conductive films and printed circuits. The Hugles remained a team throughout Fran’s life, always working together at their various endeavors, though they encountered numerous barriers in their early career to finding companies willing to hire a husband-wife team. Bill was both an inventor and an entrepreneur, while Fran preferred the engineering milieu to the business one. Still, she was not welcomed by many male engineers who resented having a woman supervisor or sometimes even a woman for a peer. Fran often said, “I am a woman and an engineer; I am not a woman engineer.” She rebelled against the idea that gender described the type of engineer she was. The Hugles worked for other electronics companies after Baldwin, including establishing Westinghouse’s digital circuit plant in Pennsylvania in 1958, but moved to Santa Clara, California in 1961. There they founded numerous innovative electronics companies, all based on equipment and manufacturing processes they developed. One of the first (and the only one that survives under the same name today) was Siliconix. The other significant and highly successful company was Hugle Industries, which manufactured epitaxial reactors and wire bonders, for the industry in the 1960s. Bill was the President and Fran the research director. Though Hugle Industries was later bought out and absorbed by a larger company, one of its spinoffs, Hugle Electronics of Tokyo, is still in business. The Hugles are considered important pioneers in the development of Silicon Valley. Considered by some her most significant patent, Fran’s 1966 process for Automated Packaging of Semiconductors (granted after her death in 1969) developed TAB (tape-automated bonding) for the first time, allowing the miniaturization we enjoy today in thousands of products from hearing aids to personal computers. In addition to her technical work, Fran was politically and socially active. She helped found the first Headstart program in the Santa Clara Valley and protested against the Vietnam War, though never crossing the line to civil disobedience as she was a firm believer in the rule of law. She was active in the Unitarian Church and an adjunct professor of chemistry at the University of Santa Clara. Fran loved the outdoors, hiking and camping in Yosemite, and surfing in Santa Cruz. She had a sharp wit and could hold her own in any conversation. She also enjoyed experimenting in the kitchen — which she regarded as her home laboratory — much to the chagrin of the children who had to eat her creations. Fran succumbed to stomach cancer at the age of 40 and died at her home. Her husband Bill went on to found many more electronics and holography businesses both in the US and around the world. He died in 2003. IEEE has set up a STEM scholarship in her name, the Frances B. Hugle Memorial Scholarship. Any donations can be made through the IEEE website. There is a drop-down menu to select the appropriate scholarship. Note: earliest patents assigned to Baldwin Piano and not clear if Frances alone or joint with William Hugle; some of later patents assigned to Westinghouse or Stewart-Warner. This entry was posted in Engineering, Mathematics and tagged Engineering, Mathematics. Bookmark the permalink. This fairy tale regarding Frances Sarnat (m. Hugle) is a near total desecration of the truth either through outright fabrications or deceptive omissions. 1) Baldwin was a household name in pianos but they were also a military contractor working on rocket technologies often in partnership with Boeing. And before joining Baldwin, Frances worked for another military contractor where she was granted a security clearance (these facts are per her resume). 2) While at Baldwin, Frances invented the integrated circuit and filed a patent for it in 1956. This was years before either Noyce of Kilby filed. 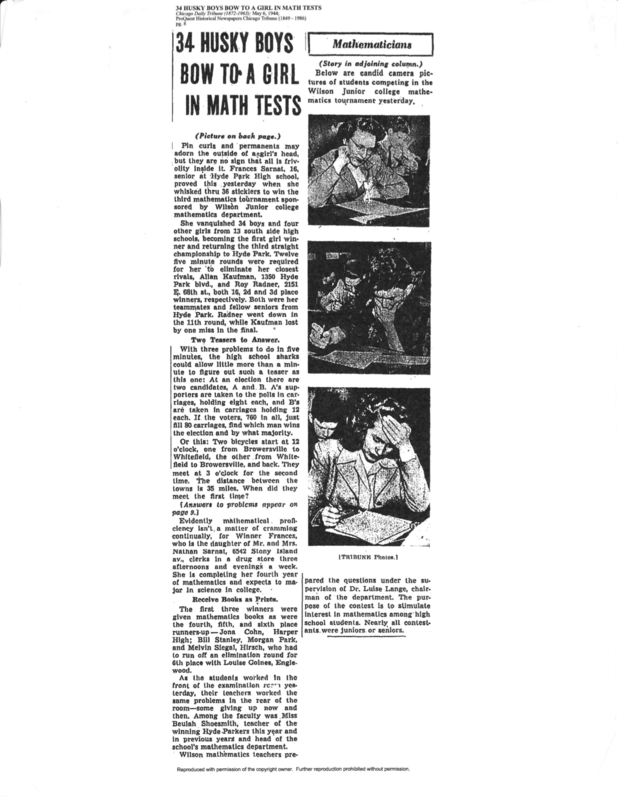 Yet Noyce and Kilby were awarded their patents while her claims were still waiting. Her claims were finally granted but years after Noyce and Kilby. 3) She also invented the microprocessor. I have given detailed exposes of these facts on the Talk pages of her Wikipedia page (quickly archived to conceal this history). She also quite possibly developed the crystals for the first transistor. This fallacious article also masks the fact that she founded her first company WITHOUT the involvement of her (soon to be) husband… who was much later involved in burying her true contributions and insuring that those who claimed her technologies as their own did so with impunity. Her husband even went so far as to assign one of her major patents to himself following her demise… a demise that is somewhat suspicious because two other wives of his close associates also developed the same cancer within a year of Frances’ death (I have computed the statistical probability of this at one in ~ 9 billion). And she most certainly NEVER built a piano from the ground up! The two we had in our home were early pianos built by Baldwin long before she was even born that were gifts from her boss… as was much of the furniture we had, hand-me-downs. This article is a tragic example of how to write a story about which one knows very little (actual inventions and work history) while spicing it with human interest inventions to lend an air of credibility. So so sad. My mother was a brilliant person of unusual integrity… who would never have stooped to such a level… Shame, shame, shame on those responsible. 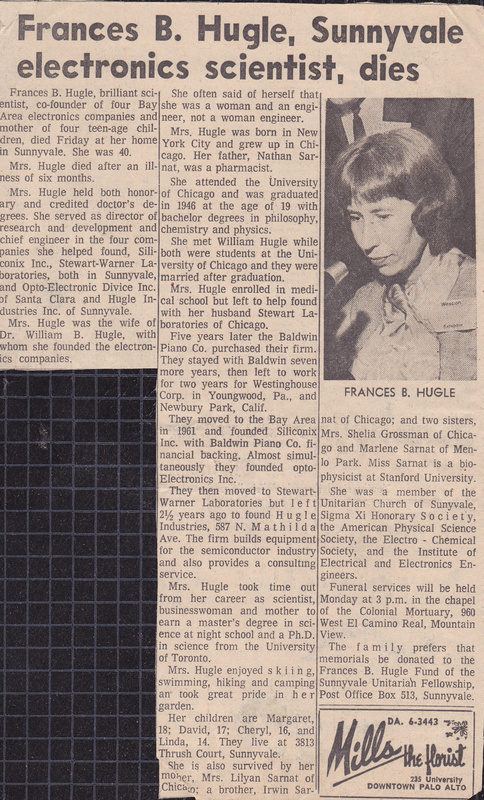 May the truth about Frances Hugle’s life finally be freed from its detractors! Given the lack of respect shown female scientists in the sixties (and earlier), and knowing just a bit about your mother personally, I would not be surprised if everything you state above is true. It is not only sad that she died so young, but also upsetting that she did not get the credit that she deserved in her lifetime. Thanks again for the enlightening info you offer above. I will never forget my mother lying on the floor and playing with you by holding you up with her feet. Do you remember that? She had such a special fondness for your family. Your father visited right up till the end… Thank you for the reply. I’m so glad (and surprised) that you remember me. I don’t specifically remember your mother holding me up with her feet, but I do clearly remember her being very affectionate and playful, and that she always made me laugh. My memories of those days are very spotty, but we absolutely LOVED going to your house. To my brother and I, Frances was like a young, funny, smart, and wonderful grandmother. Even though my life at home was very turbulent back then, your mother had a very positive and powerful influence on my parents and on my brother and me. I am so glad that I had the opportunity to know her, if only for a few years. Feel free to contact me at dullyda@comcast.net anytime to share memories.